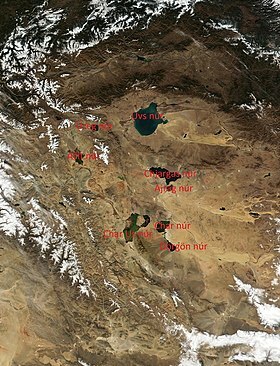 Uvs Lake Basin (also Uvs Nuur Basin or Ubs Nuur Basin; Mongolian: Увс нуурын хотгор, translit. Uws nuuriin hotgor) is an endorheic basin located on the territorial border of Mongolia and Tuva, a republic of the Russian Federation. 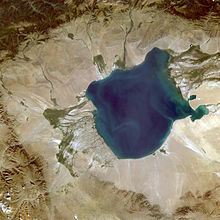 The basin is part of the Central Asian Internal Drainage Basin and is named after Uvs Lake (Uvs Nuur, Ubsu Nur), a large saline lake situated in the western part of its drainage basin. Uvs Lake is a shallow lake with an area of 3,350 km2 (1,290 sq mi). Its entire basin, which includes several smaller lakes, is 70,000 km2 (27,000 sq mi). Uvs Lake Basin may also refer to Ubsunur Hollow (Russian: Убсунурская котловина, Ubsunorskaya Kotlovina), which is the western part of the drainage basin, or to over 10,000 km2 (3,900 sq mi) of protected areas covering the lake and its surroundings. The hollow forms the northern part of the Great Lakes Depression, which has a surface of over 100,000 km2 (39,000 sq mi). The hollow, and most of the drainage basin, are situated in the Khövsgöl, Zavkhan and Uvs Provinces of north-western Mongolia, and the Mongun-Tayginsky, Ovyursky, Tes-Khemsky and Erzinsky Districts of southern Tuva. The basin is part of a combination of raised lands and hollows located throughout the Tannu-Ola and Altai mountainous regions. Here, the world's most northern desert meets the Northern Hemisphere's most southern tundra zone. An area of 10,560 km2 (4,080 sq mi), around three quarters of which lies in Mongolia, was designated Biosphere Reserve in 1997, and a partly overlapping zone of around the same size was designated UNESCO World Heritage in 2003. The Mongolian part of the lake and its immediate surroundings were further adopted as Ramsar wetland in 2004. According to Greenpeace, Ubsunur Hollow counts 40,000 archaeological sites from nomadic Scythians, Turks, Huns and other tribes. A number of its archaeological artefacts remain unstudied. In Central Asia, it has the highest concentration of burial mounds, constituting around half of its archaeological sites, and many of which are older than the Egyptian pyramids. Thousands of rock carvings and stone sculptures remain from medieval settlements and Buddhist temples. Archaeological searches carried out in 2007–2008 on the Por-Bazhyn ruins, which are situated on an islet in the Russian part of Tere-Khol' Lake, suggested that the enclosure was built around the middle of the second half of the 8th century, under the Uyghur Khaganate. The population density is low in the Ubsunur Hollow. Populated almost exclusively by the nomadic Tuvan people, cattle breeders living in yurts, The lack of industry and the reliance of the inhabitants on traditional ways of life, such as nomadic pasturing, have had little impact on the landscape and have allowed the ecosystem to remain relatively free from the negative effects that human presence can impose. 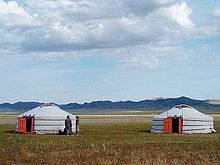 Both the Russian and the Mongolian parts of the hollow are home to nomadic Tuvan cattle herders, who live in yurts and make up virtually all of the population. The Hollow, located on the border between Mongolia and Russia, lies at the intersection of complex ecosystems. Its area is 10,688 km2 (4,127 sq mi). The terrain includes glaciers, taiga, desert, alpine tundra, sub alpine meadows, and a vast mountain taiga areas. There are also forested steppes, treeless steppes, semi-arid deserts, and ever shifting sand dunes. It is a diversified natural habitat, producing an interaction of Euro-Siberian and Central Asian-Mongolian plant and animal life. Due to its location on the cusp of the Siberian and Central Asian-Mongolian terrains, the flora and fauna of the hollow exhibit a high biodiversity for mid-latitudes. Animal species that inhabit both mountains and tundra, such as the Siberian roe deer, and Altai snowcock, flourish here. The endangered snow leopard is also present, as well as taiga dwellers such as the Caspian red deer, lynx and wolverine. Steppe dwellers include the Mongolian lark, demoiselle crane and long-tailed Siberian squirrel. Desert inhabitants include the bustard and midday gerbil. The bird species alone number some 359. Since the hollow is a protected area, many ancient species extinct in other regions have found refuge here. In 1993 Russia protected the Tuvan parts of Ubsunur Hollow as the Ubsunurskaya Kotlovina State Nature Biosphere Reserve. 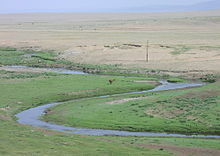 In 1995 Greenpeace Russia prepared its proposal to nominate Ubsunur Hollow, in conjunction with Mongolia, as World Heritage Site, describing it as "one of the largest intact watersheds in Central Asia". Ubsunur Hollow Biosphere Reserve is a fragile mountain hollow or depression located on the territorial border of Mongolia and the Republic of Tuva in the Russian Federation among the mountains — Tannu-Ola Mountains, and the Altay Mountains region — part of a combination of raised lands and depressions. Here the world's most northern desert meets the world's most southern tundra zone. Ubsunur Hollow Reserve (Tuva) was awarded international Biosphere Reserve status in 1998, as a step toward protecting Southern Siberia's wilderness which contain Russia's largest intact tracts of Siberian Pine and Siberian Fir-dominated ecosystems. The Virgin Komi Forests in the Russian Far East (40,000 km2). The Volcanoes of Kamchatka (40,000 km2) including unique forests, salmon streams and volcanoes on the Kamchatka Peninsula). The sources of the Ob River in the Altai Mountains (65,000 km² of mountain ecosystem) of Siberia. Vodlozero National Park (including Lake Vygozero) (10,000 km2), Europe's largest intact wetland and old-growth boreal forest (taiga) ecosystem. Mongun Taiga, Russia (50°12′N 90°12′E﻿ / ﻿50.200°N 90.200°E﻿ / 50.200; 90.200), west of the Uvs Lake drainage basin. Ubsu-Nur, Russia (50°37′N 93°8′E﻿ / ﻿50.617°N 93.133°E﻿ / 50.617; 93.133), area at the north-eastern tip of Uvs Lake. Oroku-Shinaa, Russia (50°37′N 94°0′E﻿ / ﻿50.617°N 94.000°E﻿ / 50.617; 94.000), northern part of the zone around the Tes River, adjacent to part 12 on the Mongolian side. Turgen [sv], Mongolia (49°46′N 91°22′E﻿ / ﻿49.767°N 91.367°E﻿ / 49.767; 91.367), mountain range south of Üüreg Lake, near Türgen, Uvs. ^ "Uvs Nuur Basin in Mongolia". Nasa.gov. Retrieved 2008-02-07. ^ a b c d "Russia's First World Heritage Site". Centre for Ecological Sciences of the Indian Institute of Science. Retrieved 2018-07-09. ^ a b c d e f "Uvs Nuur Basin". Greenpeace. Retrieved 2018-07-09. ^ Härke, Heinrich (2010). "Letter from Siberia: Fortress of Solitude". Archaeology. Vol. 63 no. 6. Archaeological Institute of America. Retrieved 2018-07-09. ^ "The Uvs Nuur Basin: Russian-Mongolian Cooperation for Conservation of World Heritage". UNESCO. 3 February 2006. Retrieved 2018-07-09. ^ "Uvs Nuur Basin, Russian Federation (Tuva) & Mongolia". United Nations Environment Programme. Archived from the original on 2008-05-10. Retrieved 2008-02-05. ^ a b "The Uvs Nuur Basin". www.nhpfund.org. Retrieved 2018-07-09. ^ "Southern Siberia Hotspot in the Taiga". Tiaga News. 1998. Archived from the original on 2000-08-16. Retrieved 2008-02-05.